Yellow pumpkin kootu - Usually we prepare kootu with the addition of moongdal or channa dal. 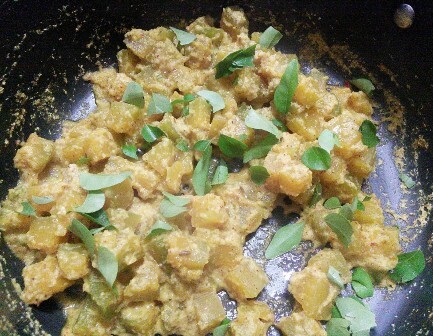 For this yellow pumpkin kootu we do not add any dals, just the coconut masala paste and a small piece of jaggery. This kootu has a bright yellow colour with a mild sweetness. 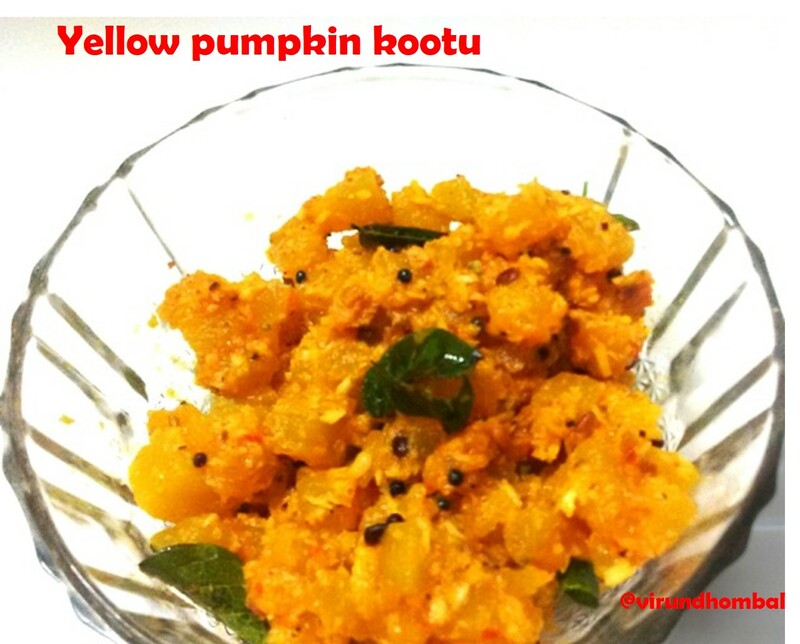 Yellow pumpkin kootu - This kootu has a bright yellow colour with a mild sweetness. 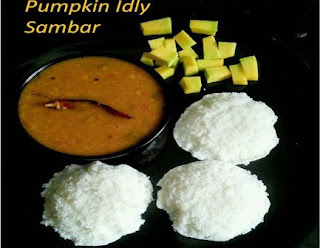 This pumpkin kootu tastes best for pulikuzhambu and sambar. Using a large, sharp knife cut it in half and scoop out the seeds using a spoon. 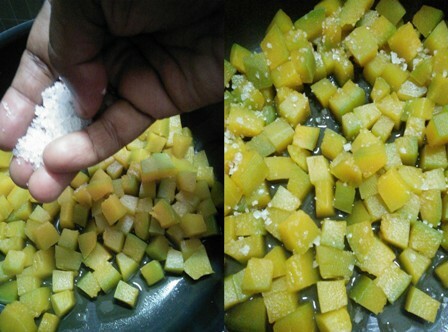 Then peel and cut into small cubes. Add the cubes in a deep vessel with little water. 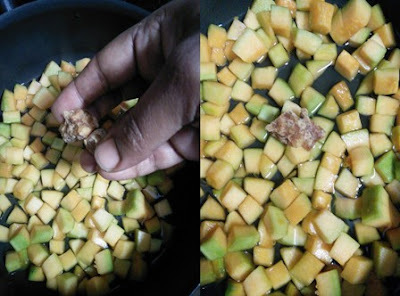 Place the jaggery cube in the centre and allow the pumpkin cubes to cook on medium flame. Grind the coconut, small onions, red chilly and jeera. In between gently stir the pumpkin with a ladle. When the pumpkins are half cooked season with the required salt, turmeric powder. 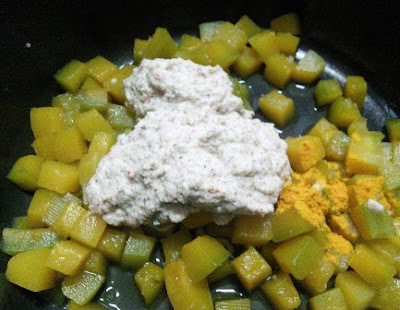 Mix them well and add coconut masala paste. Stir to prevent the bottom from sticking. Simmer until the pumpkin is soft and the raw smell of the onions and jeera disappears. Now turn off the heat. Heat a tsp of oil in a pan and add mustard, urid dal and curry leaves. When it splutters add it to the kootu. 1. Add the cubes in a deep vessel with little water. Place the jaggery cube in the centre and allow the pumpkin cubes to cook on medium flame. Do not add more water as it will turn mushy. 2. In between gently stir the pumpkin with a ladle. When the pumpkins are half cooked season with the required salt, turmeric powder. 3. Mix them well and add coconut masala paste. Stir to prevent the bottom from sticking. 4. Simmer until the pumpkin is soft and the raw smell of the onions and jeera disappears. Now turn off the heat. Heat a tsp of oil in a pan and add mustard, urid dal and curry leaves. When it splutters add it to the kootu. If you try this recipe for Yellow pumpkin kootu send us your comments below and share the recipe for your friends and family.